NEW MEDITATION AND CHANTING CD! The mahamantra, the great mantra, Om Namah Shivaya, is a throb of your own divine Self. You are the Auspicious One, Shiva. Limitless is your power, love and ecstasy. That is your true nature, your true home and refuge. Kundalini Shakti gives you the sublime form of mantra, opening the way for you to abide once again in the truth of your radical freedom. Through chanting and meditation, become absorbed in Om Namah Shivaya, watching as the power of the mantra transforms mind and body into perfect vehicles for the ecstatic One already residing within you as you. The mantra will empower you to live with the boundless wisdom, love, and creativity that radiate from your true Self. This album includes brief meditation instructions, meditative chants of Om Namah Shivaya, and silent tracks for timing your meditation. The meditation ends with the ringing of a beautiful Tibetan gong (which can be used separately on any smartphone for a ringtone or alarm tone), followed by chanting Om Namah Shivaya to ease your consciousness back into the day. 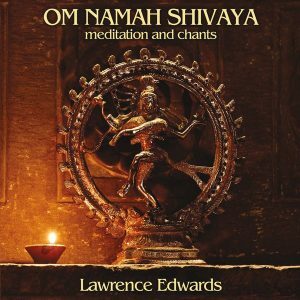 The Om Namah Shivaya chant on this album is the one that so many people attending Lawrence’s programs and retreats love for its power to ease the mind and plunge you into the depths of pure Consciousness. In the stillness of meditation Lawrence first heard Om Namah Shivaya being chanted in this way as the mantra arose spontaneously within the spaciousness of Consciousness. Shaktipat diksha is the ultimate gift that this mantra has to bestow on souls ripe for awakening. Om Namah Shivaya – “Om, I bow with reverence to the auspicious One” – Invokes the all-embracing, omnipresent One, the Divine within – Hindu. Om Kali Durge Ma – “Om, Kali Durge Mother of all” – invokes the living presence of Great Goddess Kali, the mother of the universe from whom all forms emerge – Hindu. Om Mani Padme Hum – “Om, Hail the jewel in the lotus” – Invokes the living presence of the Buddha within you as your true nature – Tibetan Buddhist. Om Tare Tam Soha – “Om, Tara, mother of all Buddhas, resounding in the heart, so may it be” – Red Tara mantra invoking Tara, Mother of all Buddhas and her boundless compassion which brings to the seeker all that’s needed to overcome obstacles – Tibetan Buddhist. La ilaha illallah – “There is no deity other than God” – Invokes the awareness of the universal One – Islam. Ein Od Milvado – “There is none but Him” – Invokes the sublime non-dual awareness that all is God, everything is God – Jewish. Kyrie Eléison – “Lord, have mercy” – Invokes the boundless compassion of the One – Christian. Sancta Maria Mater Dei – “Holy Mary, Mother of God” – Invokes the living presence of the Divine feminine as Mary, Mother of God – Christian. The last track on the album is an extended version of the slow Om Namah Shivaya chant that allows you to become more deeply absorbed in this vibration of the Divine within. The deep power of mantra arises from beyond the mind, beyond thoughts, beyond words. The ordinary mind mistakes mantra as just another thought form and thus doesn’t recognized its true potency. The real power of mantra is the Consciousness of the Self, Kundalini Shakti, vibrating into form and manifesting the sound body of the Infinite which the mind can then perceive as mantra. Take hold of the mantra and you take hold of the Divine. Absorb the mind in mantra and you dissolve back into the One, the Source of all. Know the true nature of mantra and you will know what it is to merge into the ocean of Love that is your Divine Self. The word “mantra” means “that which protects.” It protects one from the ignorance of one’s true nature and from continuously acting out of that ignorance, creating countless life-times of karma. Become absorb in the mantra and know your radical freedom, your true nature as the Self of all. You are what you seek. The ancient Vedas proclaim: Tat twam asi! Thou art That! The translations of the mantras only hint at their true meaning and power. The meaning of the words are the least important aspect of a mantra. The Consciousness that is invoked and transmitted through the mantra is what truly initiates and sustains awakening to the One. Fully enter into the vehicle of mantra and discover where it takes you. You can learn more about the power of mantra and mantra practices in Lawrence’s books, Awakening Kundalini: The Path To Radical Freedom and The Soul’s Journey: Guidance From The Divine Within. This album was created to support people in their meditative practices and the proceeds go to helping support the non-profit Anam Cara Meditation Foundation whose mission it is to make meditation available to everyone. For more information please visit www.anamcarafoundation.org. Lawrence Edwards is the founder and director of the Anam Cara Meditation Foundation. The website has additional free resources. You may laugh out loud, be moved to tears or pulled into deep contemplation by what you encounter in Kali’s Bazaar. Readers will return often to this accessible collection of poems to draw from its wellspring of devotion, revelation and celebration of the Divine present in every moment, every being and all of creation. Bring inspiration, clarity and practical instruction to your spiritual path or meditative practice through insightful and often ecstatic poetry from a devoted master meditation teacher who has more than 40 years of experience teaching and practicing the arts of meditation. Dr. Edwards has trained in Buddhist, yogic, Kundalini and other mystic traditions, in addition to his professional training in depth psychology, biofeedback and neurofeedback. Kali’s Bazaar is poetry in the ecstatic tradition of Hafiz, Rumi, and Kabir. This type of poem isn’t cultivated or tidy; it’s devotional and raw. The fundamental drive and message of Kalidas’s poems are eternally important—they speak of love, fearlessness, and joy, and they speak about all of these things in a large voice. The style of the poems departs from the more refined voice of traditional poetry, which might not appeal to every ear. But because of their driving intent to realize and “see through,” the poems in Kali’s Bazaar are worth a look for anyone trying to do the same. Extraordinary poetry — pure bhakti! Roger Woolger, world-renowned Jungian analyst, past-life healer and author of several books including The Goddess Within. This collection of devotional poems, a rarity in today’s world, will awaken the heart of love within any reader whatever their spiritual tradition. 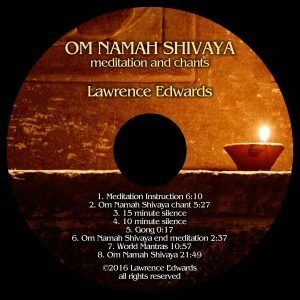 Lawrence Edwards, a long time devotee of the Devi (the archetypal feminine that exists within all), has had the blessings of some of the leading Masters of our time. As these ecstatic poems reveal, he provides a shining example of the spiritual life fully lived, able to embrace with eloquence all of life’s extremes from suffering to bliss. These poems are in the tradition of the great ecstatic poets such as Rumi, Kabir, Hafiz and others. They transport the reader beyond this world of duality into unconditioned Oneness, a rare gift indeed! Most of the poems came to Kalidas during meditation by “the Divine’s power of Grace.” Others were born amidst the challenges of daily life. The sign of a wise teacher, he doesn’t separate the inner, devotional life from the world’s suffering, but rather weaves them together masterfully. These poems radiate a passionate, timeless, love-saturated intensity and will touch your heart in unimaginable ways. Olivia Ames Hoblitzelle, author, Ten Thousand Joys & Ten Thousand Sorrows: A Couple’s Journey Through Alzheimer’s. Excerpt included in an anthology of Best Buddhist Writers, 2009. Here, gathered over many years of quest and deep experience, is a beautiful symposium of devotional poems to awaken the mind and rejoice the heart. The introduction is a powerful call to the incandescent reality of inner experience. Here are poems to savor, to guide, to bring tears and, above all, to dissolve the veil that lies between us and the Divine Presence who tells us that we live within Her Being and Her Love. Those on a sacred path will recognize that Kalidas (Lawrence Edwards) has made an authentic life journey and, through his poetry, is sharing his piercing insights and exalted states. His relationship to the Mother allows us to hear her voice in every sound, to see her magnificence in every sight, to feel her fiercely loving caress in every touch, and to sense the rhythm of her beating heart in our soul. Reading these poems transports and transforms the reader through delight and deep satisfaction. In this collection, Kalidas (servant of Kali) offers us the distillation of a lifetime of spiritual seeking and devotion. Each poem glows with the iridescent spark of that sacred essence left in the alchemist’s dish when all the dross has been sifted away. Yeats used the phrase “when naked to naked goes” to describe such moments, when the unadorned soul unites with the Beloved in shameless adoration. These poems allow us to observe at close hand this profound process by which the mundane substance of the material self is transmuted into the clarity of the refined being, the gold of pure spirit. For years a monk in India, later an accomplished Jungian therapist, workshop leader, and meditation master, Kalidas (Lawrence Edwards, PhD) now devotes much of his time to helping others on the path, particularly those undergoing unexpected Kundalini awakening. This is the gift he returns to the world, precious goods recovered from a lifetime voyage into the authentic self. The poignant imagery and keen spiritual insights I found in Kali’s Bazaar delighted me. But what moved me even more was that they revealed Lawrence – whose vast knowledge and rare understanding of Eastern traditions have long marked as a man of profound intellect – to be a man of even deeper heart…. With great humility (a sign of an authentic teacher) Lawrence Edwards reveals to us his spiritual inner life empowering us to accept our own inner experiences instead of thinking something might be terribly wrong. As we read these devotional poems aloud to each other we discovered – not new landscapes but the same landscapes with new eyes. This beautiful writing reminded us that Spirit is in everything, including our relationships. Kali’s Bazaar is definitely a gift of grace for anyone, including couples to share. lifetime to reveal the astonishing truths hidden in its pages. the light streaming from its pages! This new book offers teachings and practices not included in the audio program, while the audio program includes guided meditations, mantras and chants unique to the audio version. With his unique expertise in modern psychology, neuroscience, meditation training, and spiritual traditions, Lawrence Edwards clarifies for readers the many dimensions of Kundalini awakening, including practices and meditations for recognizing its manifestations and preparing the body and mind to enter its expansive, empowering flow. 6 CD set from Sounds True that gives you 7.5 hours of instruction, guided practices, meditations and powerful mantra chants to further your progress on your spiritual path. Kundalini is the power of Divine within that compels us to evolve and grow—identified by cultures and traditions all over the world as a key to the most profoundly transformative experiences we can have. With its ability to connect us to the energy of creation and elevate us to a higher state of consciousness, Kundalini awakening is crucial to the deepening of our spiritual evolution. But the deep spiritual unfolding that Kundalini offers can also be confusing and difficult to grasp—so how can we approach this universal power with preparation and wisdom? In Awakening Kundalini, Dr. Lawrence Edwards, who has devoted his life to understanding and teaching about Kundalini, presents an essential guide to harnessing this boundless energy. In six in-depth sessions, he offers a comprehensive exploration from the physical, psychological, and spiritual perspectives, with insights and practices for recognizing what Kundalini is, how it manifests, and when your body and mind are ready to initiate an awakening of consciousness. “You are born with Kundalini,” says Dr. Edwards. “You just need the right conditions to unfold it.” Through seven hours of teachings, learn how to open to the freedom of awakening while avoiding the pitfalls, misunderstandings, and projections that are so often a part of the spiritual journey. – Kundalini empowered practices for one to do use at home. 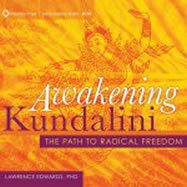 To purchase the audio program Awakening Kundalini click here. This book propels the reader onto a breathtaking visionary quest as the soul’s longing to know the Divine is answered by the loving power of grace and revelation, known as Kundalini Shakti in the yogic system. Dr. Edwards uses his personal mystical experiences to gradually unfold the tasks to be mastered and the lessons to be learned as we tread our individual path to the Divine. His wisdom is grounded in both direct experience as well as in the knowledge of Jungian archetypal psychology, Eastern and Western mysticism and mythology. The book presents a rich interweaving of personal trials and challenges, insights from poet saints and mystics, uplifting experiences of the Divine being discovered in everyday life, and lofty overviews of the spiritual terrain from different vantage points. The reader will have the good fortune to find their faith and enthusiasm for treading their path delightfully boosted by what they encounter in this book. It contains profound insights and revelations about Kundalini, chakras, the awakening of this sublime power and the direct guidance it gives the seeker from deep within. Kundalini is the Power of the Divine within everyone. The Soul’s Journey: Guidance from the Divine Within can be ordered through bookstores everywhere or online from: The Soul’s Journey Store. The Soul’s Journey: Guidance from the Divine Within is a real gift, so often we read stories about visions, spiritual experiences and mystical teachings which seem to be continents from our own experience. It is so easy to believe in such things in “romantic” kingdoms where miracles occur or even in our own literary recreations of Tibet or India and yet be unable to experience them in our own lives and lounge rooms. In this superb book, Dr. Edwards shares his experiences in a powerful and personal way and shows how visionary experiences and real spiritual growth can be achieved by all of us regardless of where we are. We learn a lot about his experiences of the divine. Even as a child he experienced the power of the spiritual world and moreover recognized it as a potent and important aspect of his life; he did this despite the discouragement of his parents and the materialistic environment of the culture around him. He carried with him the truth of his early experience of the Great Mother Goddess Kali throughout his life. Later, he became a devotee of Muktananda, a remarkable Siddha or realized master from India, and under his instruction was able to refine his spiritual life and not only experience further visitations from the Goddess bur receive instruction from her. She instructed him to transmit her teachings, so he recorded and then published them. This was his mission ordained by Kali. Kali told him stories which are enticing and enlightening. They are like the old legends and tales of the Hindu Puranas or even like the crazy wisdom of the Sufis, and while they may be enjoyable they are also allegorical and contain deep wisdom. Dr. Edwards’ book is a fascinating volume which combines a revealing and personal outline of his own experiences, profound revelations and visions and insightful commentary which is clarified by his own background in Jungian psychology. Here is an intelligent guide to spirituality which while upholding the integrity of the visionary experience (especially Kundalini), also decodes that experience and offers insights from psychology. This is a great achievement and will be of real value to anyone on the spiritual path. In this book, Dr. Edwards provides us with a substantial bridge between the teachings of the ancient masters, and explanations of how to live these very elevated lessons in our daily lives. As the title suggests, the book is an adventure. It is an adventure not only of the author’s soul but also that of the reader. In the beginning it delineates his personal journey, and I have found that wherever I have learned from an author, I have learned a great deal more from the journal of the author’s life. And so it is here. From the beginning Lawrence Edwards had visionary experiences. Even as a small child he recognized them as real, despite the discouragement of his parents, a disparagement that is so characteristic of our modern time. He retained the truth of the early visit of the Great Goddess, the Mother Goddess, the Goddess Kali. Later in life, when he devoted himself to Muktananda, a remarkable Siddha Master from the East, he opened more fully, with numerous visionary visitations from the Goddess. She instructed him to carry her lessons forward by recording them, and then publishing them. This was his mission ordained by Kali, and this is his accomplishment. Kali told him stories that are adventures in themselves. But like the great stories of the Sufi or the Hassidic Masters, these allegories are entertainment that carry great wisdom. They import the truths from the spiritual heights. Furthermore, the legends from the Goddess become elaborated by comments and explication, which then bring their symbology into life’s practice. This is an adventure of mind and soul. It is an adventure in teaching from the soul and lessons for the soul of the reader. In the tradition of guru to seeker, teacher to student, these lessons from the life and visions of Dr. Edwards become an education in living our own lives with higher spiritual aspiration and higher personal achievement. With quiet grace and the impressive assurance that comes from deep familiarity with the path, Lawrence Edwards introduces us to ever deeper levels of Divine Reality as manifested through the Goddess (Kundalini). He achieves what few dare attempt and even fewer succeed in: a profound and convincing revelation of his own inner progression along that journey of spirit to which he has been called. In his account of his personal quest, he includes the full spectrum of what seekers may expect, from the overwhelming bliss of ecstatic union to the terror of unexpected encounters with the Shadow. His learning is based on a deep familiarity with ancient teachings, but he is able to put much material in a fresh perspective; for example, he reminds of the need to keep the feminine principle ever in view, including the importance of allowing the Goddess, which is Kundalini, to direct us as the energies awaken, rather than trying to coerce Her into preset paths and institutional (patriarchal) formulas. Further, he makes a welcome and vivid distinction between that which is literal and that which is figurative in the ancient descriptions. His explanation of the chakras (“wheels”) and the “snake” of Kundalini does much to clarify the confusion which has surrounded these images through the years. Although he was a follower of external teachers for many years, he points out that the ultimate guide is the inner, rather than the outer, guru. This book is an invaluable map to all who venture into similar spiritual terrain. It will be most especially welcomed by those who have tasted of comparable experience through Kundalini awakening, visionary revelation, or the soul’s dark night. His voice is that of the authentic pilgrim whose many years of immersion into the ancient practices and lore of Siddha Yoga together with his training in Jungian/transpersonal psychology create a uniquely qualified spokesperson. He is both practitioner and scholar, with a rich familiarity with both Eastern mystical tradition and contemporary Western perspective. He is a wise and trustworthy voice, a teacher whose knowledge and counsel will benefit all those fortunate enough to be introduced to this volume. And, for persons undergoing Kundalini transformation who are seeking a more comprehensive understanding of the process, this book is an invaluable source. Dorothy Walters, Ph.D., author of Marrow of Flame: Poems of the Spiritual Journey, Unmasking the Rose: An Account of a Kundalini Initiation, and A Cloth of Fine Gold: Poems of the Inner Journey. 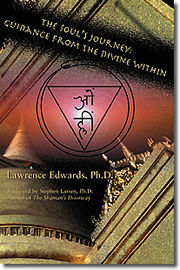 Lawrence Edwards is a mystic who shares a deep and abiding love and respect for the Divine in his work. Through sharing his visions and stories, honed in the fires of meditation and Eastern mythological symbolism, he unlocks the particular to expose the Universal connection to the Divine. For him, it is devotion to the Divine Feminine which is so powerful. …Here we see the Divine Feminine as reflected by a man in search of Her. Lawrence is also able to express the woundedness of men without the strength of a strong positive Masculine, as well. If your path is rooted in meditation and Eastern mythology, you will find a home in this spiritual autobiography which points well beyond itself. Thank you so much for the privilege of reading your book. I really like all the stories… My favorite story was the one in which you were preparing dinner for your colleagues as if you were preparing to serve God. That story just really resonated for me. I’m sure the people at your dinner table were fed and blessed by your vision of them… I found your book very uplifting and it made me want to spend hours talking with you and sharing stories and talking about how we are applying all these visions in our daily life. Kathi Kemper, M.D., M.P.H., best-selling author of The Holistic Pediatrician and Mental Health Naturally! 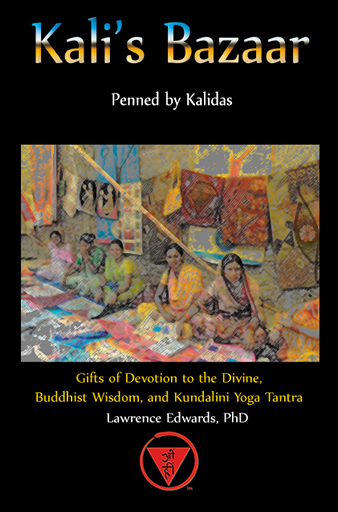 Lawrence Edwards wrote his doctoral thesis on Kundalini. The Goddess first paid him a visit when he was 3 years old (although it wasn’t until much later that he realized the magical “lady of light” was none other than Kundalini). When he humbly sought her guidance, Kundalini returned to initiate him through a series of intense experiences of mystical union… At one point, Kundalini instructed Edwards to publish the narrative visions so the world would know of her presence and purpose, which is exactly what he has done with THE SOUL’S JOURNEY. With his Jungian training, Edwards translates the images and revelationary story line of his visions into familiar actualities of the path. He also tells of unexpected twists in his own journey (past life recall, harrowing encounters with malevolent entities, sudden healing abilities) and advises readers with wisdom he’s gleaned along the way…. Most touching is his devotion to Kundalini. He tells a wonderful story about an author who had experienced Kundalini… Although Kundalini had appeared to him in a vision, he hadn’t been impressed, as she seemed to be an ordinary woman. While in the company of a yogi/saint famous for his love of Kundalini, the author again saw Kundalini manifest herself. But this time she appeared as a radiant Goddess. Stunned, the author asked why the Kundalini looked so much more beautiful in the presence of the yogi. The yogi answered simply, “Because I worship her.” As Glenn Morris would say, study on this. THE SOUL’S JOURNEY is a powerful, illuminating and inspiring book — one that anyone seeking to understand Kundalini should place near the top of their reading list. I have been reading Dr. Edwards’ book “The Soul’s Journey: Guidance From The Divine Within” and, Wow!, it’s fantastic! After seeing the Goddess in his childhood, years later, while sitting in a meditation hall, Dr. Edwards has six consecutive visions of six different forms of the Goddess prior to Kali lighting up his inner space with one cosmic revelation after another, culminating in profound realizations and a message from Kali. The Goddess then directs him to share her “gift” to him with others by writing it all down and getting it published. He is shown in visions what to write along with commentaries by the Goddess, presented to him as scenes in his mind. Dr. Edwards is just as amazed as his readers will be, and humbled by his cosmic visitations from Kali. Moreover, his surprise and humility at being “chosen” by the Divine give his words a solid ring of truth. Dr. Edwards extraordinary encounter with the Divine is one of the most impressive and inspiring books I have ever read about Kundalini. Perhaps devotion to the Mother Goddess is the highest path to fully awakening Kundalini with a Mother’s Love guiding you safely home. At last! A book on the spiritual path written by someone who has walked the walk instead of just talking the talk. Edwards’ descriptions of personal revelations by the Goddess, dating from his early childhood, give clarity, inspiration and hope to all those yearning in their lives for a closer connection with the divine. This book inspires awe at the infinite beauty, grace and love which has flowed from the Goddess in Her many forms directly to the author’s mind and soul. Just as importantly, though, it is a sobering reminder of the challenges, struggles and dangers of the spiritual quest which arise from the darkness of our own shadow side, and which we must continually acknowledge, confront and release in order ultimately to open ourselves fully to the ever-present divine love and grace always enfolding us. We see that these revelations, both positive and negative, were the product of years of intense and serious cultivation under the tutelage of a truly enlightened Master. Such devotion and perseverance, especially in the face of inner demons and outer tribulations, are the inevitable offerings necessary eventually to bear the ecstatic spiritual fruit that it has been the author’s delight to have experienced. But what is also impressive is the sense throughout that the author sees himself as a human being, like the rest of us, working to get through each day and dealing with the myriad confusions, vices, and temptations that plague us all. His commitment to confront these issues as consciously as possible is what makes this book, and his example, accessible as a “better way” to deal with our own issues. It also gives the hope that, by following this “better way”, we may ourselves one day personally experience the loving presence and guidance of the Goddess just as he has. This book, and especially the chapter presenting the allegory of “The Bird of a Thousand Lights,” came at an especially critical point in my own spiritual development. Reading that chapter brought an immediate intuitive sense of recognition. Being able to identify with the protagonist on his quest and to see clearly both where I stood in my own journey, and what the path ahead held for me, lent tremendous encouragement to me. As a long time follower of the spiritual path, I have often “found” a book which, after reading it, I knew was the “right book at the right time.” The Soul’s Journey was one such book for me, and I trust that it will be for many other “seekers” as well. I highly recommend it!